Did Free Birth Control in Colorado Drop Unplanned Pregnancies by 40 Percent? - Truth or Fiction? 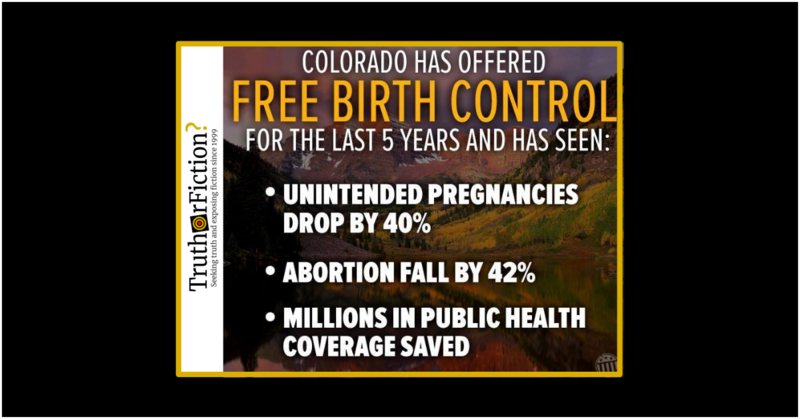 A long-circulating meme about purported effects of free birth control in Colorado asserts that the practice caused a huge drop in the state’s unplanned pregnancies and abortions. Colorado introduced a free birth control program, causing unplanned births and abortions to plummet, and saving millions of dollars. That millions of dollars in public healthcare expenditures were avoided during that period. Over the past six years, Colorado has conducted one of the largest experiments with long-acting birth control. If teenagers and poor women were offered free intrauterine devices and implants that prevent pregnancy for years, state officials asked, would those women choose them? Proponents say the program is working. The state health department estimated that every dollar spent on the long-acting birth control initiative saved $5.85 for the state’s Medicaid program, which covers more than three-quarters of teenage pregnancies and births. Enrollment in the federal nutrition program for women with young children declined by nearly a quarter between 2010 and 2013. According to the New York Times article, the birthrate among teenagers dropped 40 percent — presumably the “unplanned” pregnancies mentioned in the meme. The rate of abortions dropped 42 percent in the same cohort, but it didn’t say what the drop in non-teenaged low-income women was by comparison. It also said that for every dollar spent on the program, the state’s Medicaid program saved $5.85 — but not what the overall number of births avoided or expenditures saved might be. Colorado’s teen birth rate dropped 40% between 2009 and 2013, the Colorado Department of Public Health and Environment announced this week [in 2014], in part due to a program that provides long-acting contraception to low-income women … In 2010 alone, Colorado saved $42 million on health care costs associated with teen births, thanks to the program, according to a press release from the governor’s office. Colorado’s teen birth and abortion rates continue to plummet under a state health department family planning program that averted nearly $70 million in state and federal spending. From 2009 through 2016, the state birth rate fell 54 percent for women ages 15 to 19 and 30 percent for women ages 20 to 24. The state abortion rate declined 64 percent for women ages 15 to 19 and 41 percent for women ages 20 to 24. The number of teens giving birth for the second or third time dropped 63 percent during the same time period. An independent analysis by University of Colorado researchers concluded that the state health department’s family planning program was responsible for as much as two-thirds of the drop in births from 2009 through 2015, averting $66.1 million to $69.6 million in potential costs for four state and federal programs that provide health care, food and other assistance to low-income women and their infants. In other words, the meme’s claims actually understated the effects of Colorado’s free birth control program by 2019. The drop in teen births fell to 54 percent in subsequent years. The abortion rate also fell further, to 64 percent. And the 2017 update from Colorado’s health officials indicated that it estimated that $66.1 million to $69.6 million in expenditures related to unplanned pregnancies and births had been averted. Did Sen. Dianne Feinstein Say It’s Unfair That Smaller States Count as Much as California Because of the Electoral College?